Since 2014 tens of thousands of users have installed the free, open-source AdNauseam extension to protect themselves against online advertising surveillance. AdNauseam, a not-for-profit, research-based privacy tool, hides and clicks every tracking ad that it identifies in order to resist the opaque collection, analysis and monetization of private user data, and to challenge the intrusive and unethical business model that currently dominates the web. 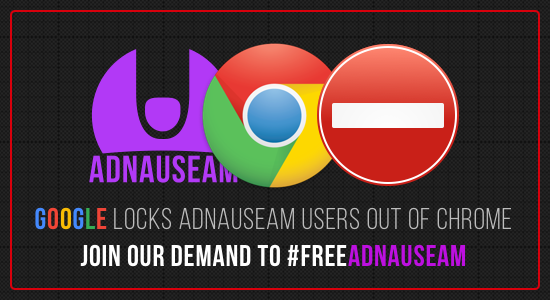 Earlier this week, on Jan 1st 2017, we were informed by our users that Google had banned AdNauseam from its Chrome Web Store. We’ve since learned that Google now also disallows users from manually installing and updating AdNauseam, thus locking users out of their own saved data, all with no prior notice or warning. We wrote Google to ask the reason for this sudden move and they responded that AdNauseam had breached the Web Store’s terms of service, stating that “An extension should have a single purpose that is clear to users…”, but providing no detail as to what the multiple purposes might be. To be clear, AdNauseam has a single purpose which we believe to be readily apparent to users; namely to fight back against the mass surveillance conducted by advertising networks, of which Google is a prime example. We can certainly understand why Google would prefer users not to install AdNauseam, as it directly opposes their core business model, but the Web Store’s Terms of Service do not (at least thus far) require extensions to endorse Google’s business model. Moreover, this is not the justification cited for the software’s removal. Our requests for more details regarding the removal have received no response. Giving Google the benefit of the doubt, we have submitted a new version for review, clarifying the wording of our “Block Malware” feature, which we now describe more accurately as “Block Malicious Ads”. However, all aspects of AdNauseam’s functionality (hiding, blocking and clicking Ads) are essential to the privacy solution we have been developing and distributing (through the Firefox, Opera and Chrome stores) for nearly 3 years now. Both our means and our ends are 100% transparent and available for scrutiny via our open source code and site: AdNauseam.io. We hope (and expect) Google to continue respecting the autonomy of Chrome users by allowing them to protect themselves from intrusive surveillance, no matter who the perpetrator. Finally, while we hope that Google will lift these unwarranted sanctions for AdNauseam, it highlights a much more serious problem for Chrome users. It is frightening to think that at any moment Google can quietly make your extensions and data disappear, without so much as a warning. Today it is your privacy tool, tomorrow it is your photo album or password manager. Google’s grip over Chrome users is a forceful one, but brave users can find instructions for installing AdNauseam without having to ask Google's permission. You are encouraged to spread the word and keep updating via the #FreeADNAUSEAM hashtag on Twitter.